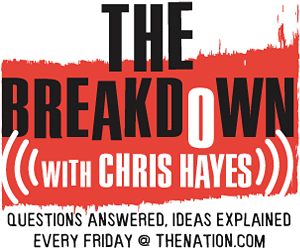 The Breakdown: How Will Citizens United Shape Our Democracy? Lawrence Lessig talks to Chris Hayes about what progressives can do to combat the destructive effects of corporate money in elections. Lawrence Lessig joins Chris Hayes to explain what Democrats and progressives can do to combat the destructive effects of corporate money in elections unleashed by the Supreme Court ruling. In this year’s Citizens United v. Federal Election Commission decision, the Supreme Court ruled that corporate expenditures for independent political broadcasts could not be limited under the First Amendment. With pre-election political campaigning in overdrive, what implications will Citizens United have for our electoral process? Will any of the pending bills on campaign finance reform curb the effects of the Citizens United result? And what is the Democratic Party doing to combat corporations pouring unlimited money into elections? Lawrence Lessig, the Director of Harvard’s Edmond J. Safra Foundation Center for Ethics and author of the Nation article “How to Get Our Democracy Back” joins DC editor Chris Hayes on this week’s edition of The Breakdown to explain what politicians and progressives can do to limit the damage from Citizens United this year and in 2012. Video of Lawrence Lessig speaking at MIT, September 30, 2010. “Democracy after Citizen’s United,” by Lessig, Boston Review. More information about Lessig from the Berkman Center for Internet and Society at Harvard University.